Roluos is a village about eight miles southeast of Angkor Wat. 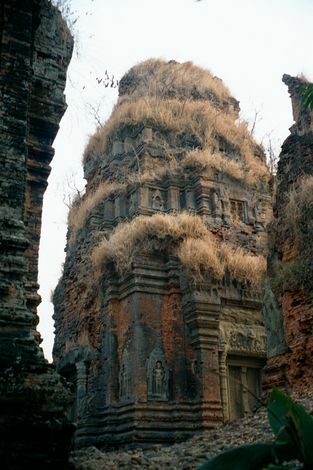 Nearby, to the west, is a group of three temples older than anything in the preceding folders. 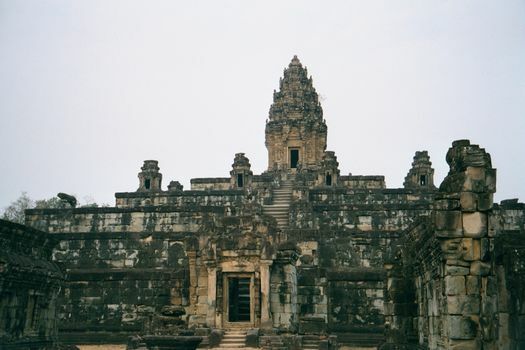 All were built shortly after Jayavarman III moved the Khmer capital down from the northern mountains and in 870 established a new capital at a place he called Hariharalaya. It didn't last long. In 905, Yasovarman I abandoned the site and moved the Khmer capital to Bakheng, immediately west of the site of Angkor Wat. 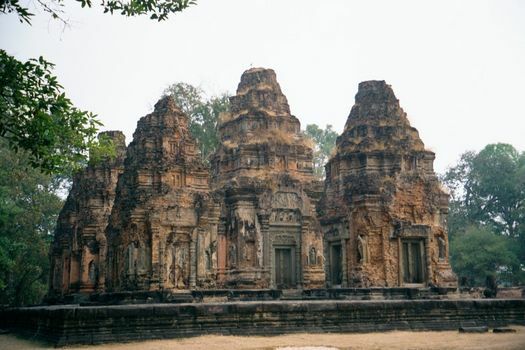 Still, the temples of the Roluos Group are today the oldest easily accessible Khmer temples, and they exhibit many of the features most characteristic of later ones. 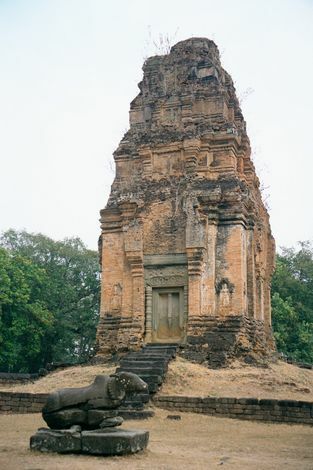 This is Preah Ko, the "sacred bull," a reference to Shiva's mount, the bull Nandi. 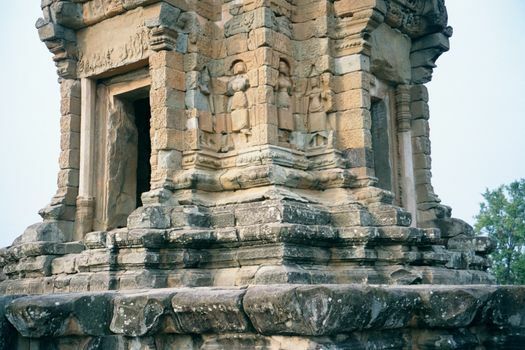 Preah Ko is the oldest of the three monuments in the Roluos group and was built about 880 by Indravarman I. The six towers commemorate ancestral kings and their wives. The towers already show the Khmer fondness for geometry: the towers are all square, cardinally oriented, and so symmetrical that they each have three false or blocked doors, plus a functioning door opening to the East. The builders are already working in brick, too, with stucco finishing and sandstone trim. 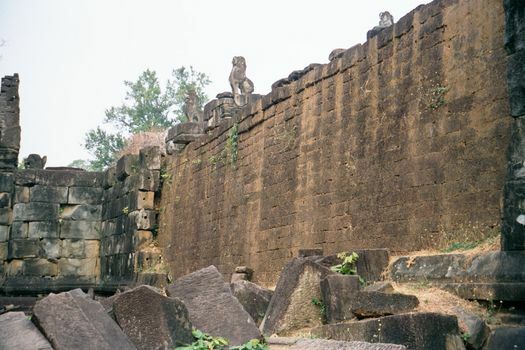 Immediately to the south of Preah Ko is Bakong, the Khmer's first temple mountain. Consecrated to Shiva in 881 (and reconstructed in the 1930s), it served as Hariharalaya's state temple. The structure of the massive outer wall is shown here, with sandstone facing on a laterite core. 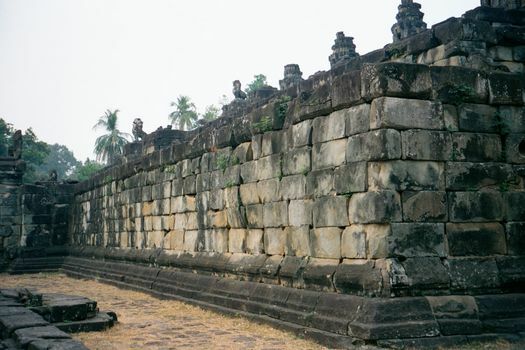 In what would remain standard Khmer practice, the temple was laid out with concentric walls: this is the inner wall, of massive sandstone blocks. Within these walls rose a five-tiered pyramid. (Disregard the lotus tower; it was added centuries later and replaced a now-vanished tower.) Here, for the first time, is the Khmer representation of Mt. Meru, the center of the world. 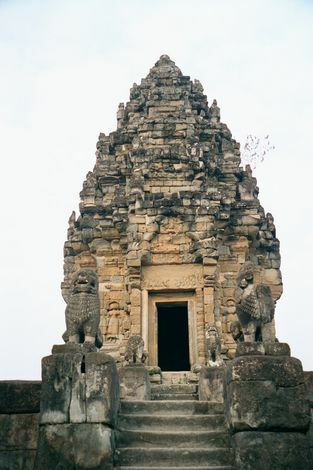 The lotus spire, in the Angkor Wat style of a later century. Up close, the seam between older and newer is clear. 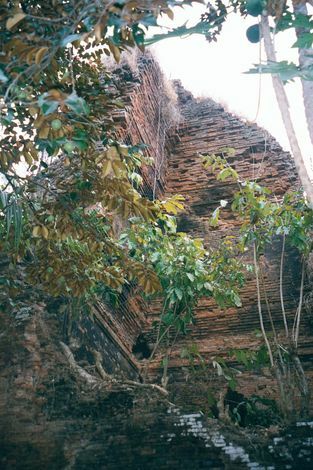 Bakong's pyramid is ringed with eight brick towers, comparable to those at Preah Ko. In front of this one, on the west, sits Nandi, Shiva's "sacred bull." 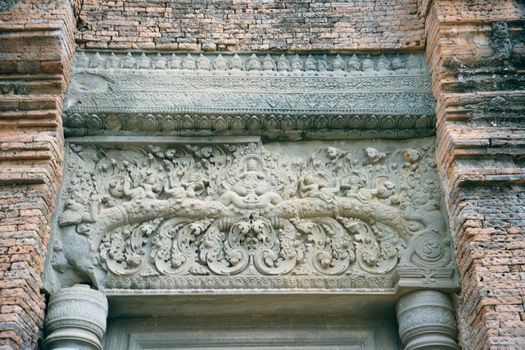 The false door on the same tower shows the already mature decorative style of the Khmers, not only with sandstone lintel but with decorative motifs that would last for centuries. Here, for example, is the jawless monster Kala, who had tasted the elixir of immortality: he was beheaded--losing his jaw in the process--but he did not die. Instead, garlands spew from his mouth, representing the elixir he had tasted. Entering the tower thus signifies entering immortality. The Kala motif is very widespread throughout the areas penetrated by Hinduism and Buddhism. The last of the three monuments: Lolei, dedicated in 893 by Yasovarman I. It was he who moved the capital to Bahkeng, immediately west of the site of Angkor Wat. Only four of six planned towers were built. They stood--another precedent--in an island in Angkor's first baray, now dry. Uniquely, they were separated by water channels fed from a central pedestal with a Shiva lingam. Two of the four towers are in ruins and reveal the hollow structure.